How do you find your Hull Number? Do you have information on the New England Beetle Cat Boat Association? The website for the Beetle Cat class association can be found at (www.beetlecat.org). Here Beetle Cat owners can learn the benefits of membership, which includes a free copy of the members handbook and a subscription to the class newsletter. A new member application form can also be found on the website. Do you have reefing advice? Click here to read a fabulous article on reefing. Click here to read an article on scandalizing. Are plans available for the Beetle Cat boat? No. In order to protect our copyright and trademark of the boat, the plans are not made available to the general public. 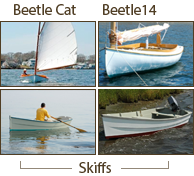 However, if you can locate an old boat, you are free to do a complete rebuild using the old hull as a guide and all parts are available from Beetle, Inc.
Do you build fiberglass Beetle Cat sailboats? There is no such thing as a fiberglass “Beetle Cat”. A beetle cat is ALWAYS built out of wood. We are sometimes asked why we don’t build in fiberglass, and the answer is evident with the first whiff of cedar upon entering our shop! How long does it take to build a new Beetle Cat? The build time for a new boat is normally 8 – 10 weeks. We encourage people to place orders in the fall to guarantee Spring delivery. What is the lead time on parts? We have 95% of the parts in stock, ready to go. Parts that need to be prebent (i.e. frames, coamings) should be ordered a week or two in advance to allow for bending time. How do I designate the frames in a Beetle Cat when ordering? The frames are numbered from the stern forward. Full frames #1-8 lead up to the centerboard box half frames #9-15 along the centerboard box should also be identified as port or starboard and finally frames #16-20 are forward of the box. We normally do not supply frames #21-23. What is the length of the centerboard pennant (board to knob) for the proper centerboard depth? The distance from the top of the centerboard to where the knob stops the board should be 20″. A centerboard cam cleat is normally mounted on the well top to allow for adjustments in the depth of the board when underway. Do you have any Used Boats for sale? We normally have at least 4 or 5 used boats in-house that we broker for the owners. They are given a general survey when they arrive and a recommended sale price. We do not sell used boats sight unseen. Occasionally, we may also have an older boat that has been completely refurbished at our shop for sale. What is the difference between your boat and the boats built at the International Yacht Restoration School (IYRS)? The boats at IYRS are rebuilds done by 1st year students. The lines are taken off the old boats and then are rebuilt over the course of the year. The boat construction varies with each boat depending on the ability of the student. We are the sole builder of new Beetle Cat sailboats, using standardized parts, proven methods, and highly skilled craftsman. Can my local boat yard do the necessary repairs to my Beetle Cat? There are very few boat yards in this day and age that can do quality wood boat repairs. As the Builder, we are uniquely qualified to repair and maintain the boat, in addition to having all the Beetle Cat parts readily available at a reasonable price. How do I rig a Beetle Cat? See the attached for a sketch and description. The sail and deck plan is also helpful to reference when rigging the boat. What is the difference in maintenance between a wood and a fiberglass boat? Essentially none. The varnish and bottom paint should be done on both every year. The topsides are sanded and painted on a wood boat, while they are washed and waxed on a fiberglass boat. What is the best way to store my Beetle Cat? The Beetle Cat should preferably be stored inside in an unheated area. The weight of the boat should be supported along its keel during storage. What trailer do you recommend for the Beetle Cat? We highly recommend the Shoreland’r brand trailer. We customize the trailer for the Beetle Cat by adding 8″ wide keel rollers for proper support and adjust the bunkers to fit the boat. Allow 1 to 2 weeks lead time when ordering. What is the difference between the Beetle Cat and Beetle 14? The Beetle 14 is a completely new in-house design by Bill Sauerbrey. It includes seats, is 80% larger in volume than the Beetle Cat, and has the same traditional look and feel. How long does it take to build the Beetle 14? The Beetle 14 takes 12-14 weeks of actual build time, BUT, it is more of a custom build and we recommend orders be placed at least 6 months in advance to guarantee delivery. Are your custom boats being built on Spec? Our custom boats are built to order and normally take 1.5-2 years to build. Why should I have my boat built at your shop? The simple answer is: we will not compromise quality to get the job done. From selection of wood, to purchasing of domestic bronze wood screws and hardware, we go out of our way to ensure the highest standard of craftsmanship and the highest quality of materials. A lot of people call themselves “traditional wood” boat builders, but then use epoxy and modern methods of construction in the process. We pride ourselves in researching and building the boat the way the original designer/builder would have intended!